It is necessary to determine the idiopathic inflammatory myopathy (primary or secondary PM or DM), course of the disease (acute, subacute or chronic) and extent of the disease activity (low, average, high or remission). An acute course of the disease is characterised by marked fever and increased generalized impairment of striated muscles leading to immobility, features of progressing dysphagia, dysarthria, heart and other organ system involvement. Patients with an acute course of the disease may die from aspiration pneumonia which typically occurs and spreads in pulmonary hypoventilation, cardiopulmonary insufficiency and renal failure. A subacute course of the disease is characterised by slight symptoms, which usually aggravate after 1 – 2 years following the onset of the disease. The clinical manifestations with severe muscle involvement, visceritis and calcification are typically seen. A chronic course of the disease is characterised by slight skin and muscle involvement, and a wave-like course of the disease. 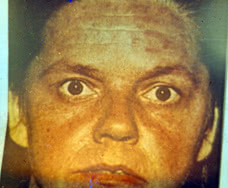 Skin changes similar to poikiloderma typically develop. Hyperkeratosis, hyperpigmentation, telangiectasia, thinning-out and dryness of skin are often seen. Processes of atrophy and sclerosis usually prevail; however, local muscle involvement including muscles of the distal parts of the extremities is also possible. Visceral manifestations are rare. Clinical syndroms and variants. Polymyositis syndrome is manifested by proximal muscle weakness, especially in upper extremities as well as by increased activity of muscle enzymes. Visceral organs may be also involved. Cutaneous manifestations are typically absent. Dermatomyositis syndrome. Along with the sings of PM, skin is typically involved. Two types of DM which are clinically and prognostically different are singled out. They are the following: 1) The 1st type is characterised by the presence of antibodies to synthase. Autoantibody to aminoacyl-t-RNA-synthase synthesis is associated with the development of the so-called antisynthase syndrome which is manifested by an acute onset of myositis, interstitial pulmonary involvement (it occurs in 50 – 70% of patients with Jo-1 antibodies), symmetric polyarthritis (which is typically non-erosive and is commonly characterised by involvement of small joints of the hand and radiocarpal joints). Fever and Raynaud’s syndrome are also possible. 2) The 2nd type is characterised by the presence of Mi-2 antibodies. It is manifested by heliotrope (or “sun”) eye-lids (that is stained violet and swollen eye-lids). Gottron papules consisting of slightly elevated violaceous papules and plaques are typically found over bony prominences, particularly the metacarpophalangeal joints, the proximal interphalangeal joints. “Shawl sign” may appear in a V-shaped distribution over the anterior neck and upper chest and back. It is prognostically more favourable. PM or DM associated with a malignancy syndrome. Malignancy is revealed in 10 – 25% of patients with inflammatory myopathies. It occurs more frequently in adults. DM is most commonly observed. Although skin and muscle involvement are not pathogenetically different, they are considered to be separate and they are assigned to paraneoplastic syndrome. Typical malignancies which are associated with myopathies include: lung, gastrointestinal, breast, uterus and ovary cancer. Treatment of tumor usually results in the improvement of clinical manifestations of myopathy, however, the prognosis remains unfavorable. Juvenile DM. Children suffer from DM more frequently than adults. At an advanced stage of DM contractures due to calcification of inflammatory muscles may develop. Children usually develop contractures 5 times as frequently as adults. In most patients generalized involvement of small vessels as in vasculitis typically results in ischemic skin, muscle and intestinal involvement. Foci of skin necrosis, ischemic kidney and gastrointestinal infarctions are often observed in juvenile DM. Ischemic brain infarction is less common. Cross syndromes. Muscle involvement similar to PM may also occur in systemic lupus erythematosus (SLE), systemic scleroderma (SS), rheumatoid arthritis (RA) and Sjegren’s sicca syndrome. Three variants of combination of PM/DM with another connective-tissue disease are singled out. They are the following: 1) Clinical signs of another connective-tissue disease, for example, systemic lupus erythematosus or systemic scleroderma may be revealed in PM/DM. 2) Clinical signs of PM/DM and another connective-tissue disease may occur concurrently, thus forming a mixed connective-tissue disease or overlap syndrome. 3) PM may develop in some another diffuse connective-tissue disease, for example, systemic scleroderma or systemic lupus erythematosus. PM is considered to be the syndrome of underlying disease. Inclusion body myositis. Clinical manifestations are similar to those in primary PM. Men are more frequently affected than women, especially males older than 50 years. It is characterised by a slowly progressive clinical course. It is manifested by muscle weakness, asymmetry of the lesion, moderate or slight increase of creatine phosphokinase activity and electromyogramm changes. Early appearance of weakness of four muscles of the thigh, flexors of fingers and wrist as well as proximal and distal muscle involvement are typical of this type of DM. Absence of autoantibodies as well as vacuolization of muscle fibers, necrosis and regeneration associated with amyloidosis are often revealed on muscle biopsy. Inflammatory infiltrate composition and mechanisms of muscle fiber affection are similar to those in PM. Clinical manifestations. 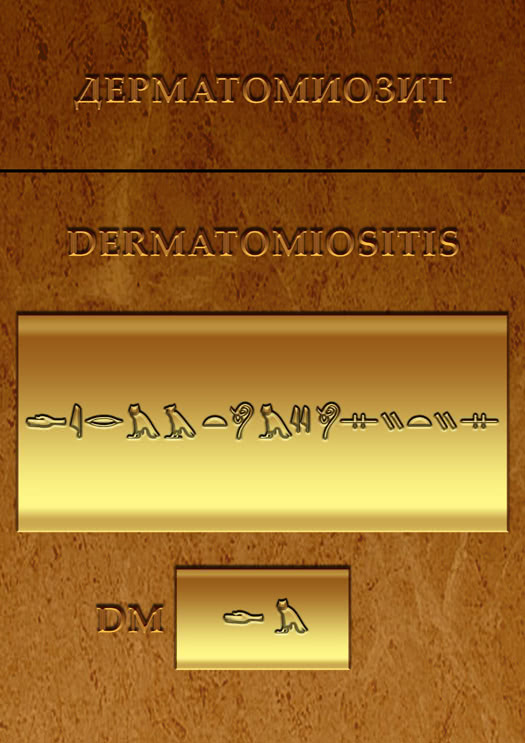 Skin and muscle involvement is considered to be the main clinical manifestation of DM. Skin changes are usually polymorphous. Erythema, edema and dermatitis are characteristic features of skin involvement. The main cutaneous feature of DM is erythema with scales and atrophy which often spread over the face, neck, upper parts of the trunk and extensor surfaces of the extremities. Erythema in DM is quite stable and is often associated with edema, which is sometimes similar to Quincke’s edema, especially at an initial stage of the disease. Soft tissues are typically enlarged, pasty-like when palpated, covered with pruritic erythema; less commonly they are associated with hemorrhages, telangiectasias, ulcers and hyperkeratosis. Pathognomonic changes occurring in DM include heliotrope (“sun”) eye-lids (that is stained violet and swollen eye-lids) and Gottron papules consisting of slightly elevated violaceous papules and plaques over finger joints. Other symptoms include “mechanic’s hands”, that is hyperkeratotic eruptions over the fingers and palms and “shawl sign”, that is a V-shaped erythema over the anterior neck and upper chest and back. In the course of DM erythema and edema spread over other parts of the body. Atrophy, pigmentation and dryness of skin usually aggaravate. 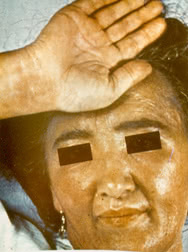 Foci of skin depigmentation may occur. Nail trophic changes and hair loss may be observed. Mucous membranes may be also involved leading to conjunctivitis, stomatitis, edema of fauces and true vocal cords. Sometimes Raynaud’s syndrome may be present. It usually has a two-phase course and doesn’t cause trophic ulcers. Although cases of periungual bed infarction, petechia and livedo reticularis have been reported. Muscular syndrome is the key syndrome in diagnosis of DM/PM. Severe, sometimes necrotic myositis of proximal muscles of the extremities is typical of DM. Muscle weakness is usually slowly progressive. However, in some cases the disease may have an acute course. In this case it is characterised by a rapid development of acute respiratory and renal (myoglobinuria) failure. Muscle weakness, especially muscles of the pelvic girdle and the thigh is considered to be the primary manifestation of DM. However, the earliest symptoms may include dysphagia and weakness of neck muscles. Symmetric proximal muscle weakness of the extremities is typical. Patients often begin to note weakness of muscles when combing their hair, dressing themselves, climbing stairs, walking, rising from a sitting or lying position, though the movements of hands, fingers and feet may be quite normal. Larynx and pharynx muscle involvement typically results in dysphagia, nasality (nasal intonation), sometimes aphonia, hoarseness, choking on swallowing. Aspiration of food into the trachea is also possible. Patients with PM/DM have difficulties in swallowing solid and liquid food which sometimes passes through the nose. In DM/PM the upper portion of the esophagus, muscles of the soft palate and the tongue are usually involved. In case of ocular muscle involvement diplopia and ptosis may develop. When facial muscles are involved, the person may develop a mask-like face. Sphincter involvement typically results in sphincter incompetence, that is involuntary defecation and urination. Intercostal muscle and diaphragm involvement may result in disturbed respiration. Muscles are usually tender on palpation, swollen, pasty-like, however, they become sclerosed in the course of the disease. Calcium deposits are often seen (that is ossifying myositis). They are typically revealed at X-ray examination of the muscles of the shoulder and pelvic girdles. Calcinosis in PM/DM is usually secondary and is often localized under the skin in the form of plaques or massive deposits in the areas of the shoulder and pelvic girdles where muscles are mostly affected. Areas of fascia and subcutaneous fat which are adjacent to the involved muscles are typically calcified. Joint syndrome is less typical and is usually manifested by arthralgias or periarticular tissue involvement. Arthitis is rare; however, it is usually symmetric and non-destructive. Disorders of joint functions and the formation of contractures are typically associated with muscle involvement. Internal organ involvement is seen in most patients with PM/DM but do not prevail in the clinical picture of the disease. Pulmonary involvement is manifested by muscle weakness which usually spreads over the respiratory muscles, including diaphragm. It may be the cause of reduced respiratory function. Clinical manifestations include accelerated respiration and hypopnoe, inspiratory dyspnea, hypostatic pneumonia, marked pain syndrome. Pulmonary involvement may occur in the form of typical vascular or interstitial pneumonia (for example, pneumonitis, alveolitis) and aspiration pneumonia which is aggravated by respiratory muscle involvement. Pulmonary fibrosis with the signs of pulmonary hypertension and respiratory failure (for example, fibrosing alveolitis) may also occur. It is characterised by increased inspiratory dispnea, dry cough, crackling rales in the lower part of the lungs, pulmonary failure. Cardiac involvement: myocardium is most commonaly affected; pericardium and endocardium – less commonly. Focal or diffuse myocarditis with dystrophic changes of the myocardium, cardiosclerosis, cardiofibrosis or arrhythmias may develop. Cases of dilated cardiomyopathy have been reported. Constrictive pericarditis is often seen in increased disease activity. Renal involvement in DM/PM occurs quite rare and varies from focal glomerolonephritis or transient proteinuria to severe diffuse glomerolonephritis and myoglobinuria kidney with features of renal failure. Gastrointestinal involvement is seen quite often and is manifested by increased dysphagia (due to involvement of the muscles of the fauces and the upper portion of the esophagus), loss of appetite, sometimes pain in the abdomen and symptoms of gastroenterocolitis. Dysphagia typically develops due to a reduction of contractile activity of pharyngeal muscles and muscles of the upper portion of the esophagus, disturbed peristalsis, muscle weakness of the soft palate and the tongue. Sometimes dysphagia may be the earliest symptom of the disease. Esophageal sphincter involvement typically results in reflux esophagitis. Severe form of progressive dysphagia when solid food is regurgitated and liquid food passes through the nose usually poses a threat to the patient’s life. Neurological disturbances are not commonly seen and are manifested by various changes of sensititvity such as hyperaesthesia of peripheral or radicular type, hyperalgesia, paresthesia or areflexia. Sometimes pseudoneurological symptoms may occur. Poorly marked polyneuritis or even CNS involvement may develop due to vasculitis. Absence of reflexes in the involved extremities results from severe muscle involvement. Electromyography is commonly used to identify the cause of muscular changes. Endocrine disturbances are quite rare. Weight loss is considered to be the most common general symptom. Sometimes it may be rather significant. Fever is typically seen in an acute course of the disease or after an exacerbation of the disease. In most patients subfebrile temperature is typically seen. Lab findings and other tests. Disease activity in DM/PM is characterised by mild anemia, leukocytosis, less commonly by leucopenia, eosinophilia, increased erythrocyte sedimentation rate (ESR), increased concentration of alfa-2 and gamma-globulin, seromucoid, ceruloplasmin, C-reactive protein. Typical features of PM are elevated levels of muscle enzymes which are found in muscular tissue. They include creatine phosphokinase (CPK), fructose diphosphate aldolase, lactate dehydrogenase (LDG), aspartate and alanine aminotransferase. Creatine phosphokinase levels may yield abnormal results. For example, its concentration may be 80 times as high as the normal one. Its concentration increases by 5 – 10 times in DM. However, some cases when patients don’t develop increased levels of creatine phosphokinase have been reported. In most patients elevated levels of serum myoglobin are typically revealed. Myoglobinuria is seen less commonly. Enzymeemia activity correlates with the extent of the disease activity and it may be helpful in the assessment of efficacy of treatment. The range of autoantibodies revealed in patients depends on the type of PM/DM and the presence of concomitant diseases. In most (approximately 80 – 90%) patients with DM/PM antibodies to nuclear or cytolplasmic antigens (for example, Hep-2 cells) are typically present. Positive antinuclear antibodies with ring-like staining are common in patients with inflammatory myopathies. Inflammatory myopathies induce formation of autoantibodies to myocytes. These antibodies are rarely revealed in other autoimmune diseases and are considered as myositis-specific. They may be divided into 4 groups. They are the following: 1. Antibodies to synthase of transfer RNA (anti-aminoacyl-tRNA-synthase). They take an active part in affection of skeletal muscles (antisynthase antibodies). They interact with cytolplasmic enzymes which mediate the link between aminoacids and transfer RNA. Antibodies to histidil-t-RNA-synthase are more frequent in patients with PM. In PM, especially in patients with interstitial pulmonary involvement, production of antisynthase antibodies is associated with the development of antisynthase syndrome. 2. Antibodies to signal recognition particles interact with one of the components of the cytoplasmic protein complex which is responsible for the transfer of polypeptides through the membranes of endoplasmic reticulum and block it. 3. Anti-Mi-2 antibodies interact with nucleoproteins whose function remains unknown. They do not combine with cytolplasmic proteins of myosin-specific antigens. 4. Antibodies to elongation factor i-alfa which provides transfer of aminoacyl-t-RNA-synthase to ribosomes and its movement along the polysome. Sometimes muscle biopsy, either of the deltoid muscle or quadriceps, may enhance the clinician’s ability to diagnose DM. The disease which is revealed with the help of skin and muscle biopsy is not specific. It should be considered in diagnostics and differential diagnostics of the disease only in combination with clinical and laboratory findings of PM/DM. Electromyography (EMG) enables the doctor to reveal reduced amplitude and shortened bioelectric potential of the affected muscles, polyphasy, sometimes – pathologic spontaneous activity such as fibrillation, pseudomyotonic disturbances, etc. EMG findings are not typical of DM/PM; they may vary in the course of the disease. Thus, they don’t enable the clinician to differentiate PM/DM from other myopathies. 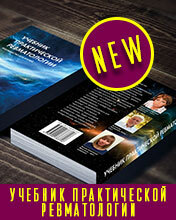 However, they are widely used in combination with other clinical findings and methods of examinatio Diagnosis. No international criteria which can aid in the diagnosis and classification of DM/DM exist. However, in 1975 A. Bohan and J.B. Peter suggested a set of diagnostic criteria and in 1985 Т. Меdsger and А. Маsi suggested a set of classification criteria which are used in the diagnosis and classification of DM/DM. Seven diagnostic criteria of DM/PM are usually singled out. They are the following: 1) Common skin changes 2) Progressive proximal symmetrical muscle weakness (according to the patient’s past history and physical examination) 3) Elevated levels of one or more serum muscle enzymes 4) Abnormal (myopathic) findings on electromyogram (EMG) 5) Abnormal findings (polymyositis) on muscle biopsy 6) Increased creatinuria 7) Reduction of muscle weakness after corticosteroid therapy. According to A Bohan and J.B. Peter, who suggested first five criteria, the presence of the first criterion or any other three criteria enables the doctor to make the diagnosis of DM. When the first criterion or any other two criteria are present, DM is considered to be likely. When the first criterion or some other criterion is present, DM is considered to be possible. In PM 4 out of 5 criteria enables the clinician to make the diagnosis of certain PM. When 3 out of 4 criteria are present, PM is considered to be likely. When 2 out of 4 criteria are present, PM is considered to be possible. These criteria were revised by Tahimoto et al. in 1995. They include the following: 1. Skin changes: a) Heliotrope skin rash (light-violet erythema with edema of the upper eye-lids); b) Gottron papules; c) Erythema on the back surface of the joints of the extremities It is slightly raised. A slight scale may be present. Light-violet erythema in the knee and elbow joints is also common; 2. 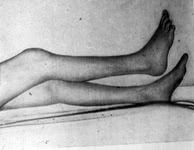 Proximal muscle weakness (upper or lower extremities and the trunk); 3. Elevated levels of creatine phosphokinase (CPK) or aldolase; 4. Pain in muscles when they are pressed or spontaneous pain; 5. Electromyogramm changes such as short polyphase bioelectric potential, fibrillation and pseudomyothic discharge); 6. Revealing of antisynthase antibodies; 7. Non-destructive arthritis or arthralgias; 8. Features of systemic inflammation (body temperature is usually higher than 37 C°, increased C-reactive protein or erythrocyte sedimentation rate levels – more than 20 mm/hour are present). 9. Myositis revealed in biopsy material (that is infiltration of skeletal muscles with inflammatory cells and focal or extensive degeneration of muscle fibers leading to necrosis and regenerative processes with irregular substitution of muscle fibers for fibrosis). If any cutaneous manifestation and at least 4 other criteria are present, DM is highly possible. If 4 criteria from the second to the ninth are present, the diagnosis of PM is probable. Differential diagnostics. Despite typical clinical manifestations of PM, its diagnostics, especially at an initial stage, may be somewhat difficult. PM should be differentiated from other diseases, which are associated with proximal muscle weakness and marked myalgias. PM should be differentiated from: 1. Infectious myositis 1) Viral myositis (coxsackieviruses, ECHO, influenza and HIV viruses) 2) Myositis in toxoplasmosis 3) Myositis in trichinosis 4) Myositis in cysticercosis 2. Metabolic myopathies 1) Acute alcohol myopathy 2) Mc Ardl’s disease 3) Carnitine-palmitil-transferase deficiency 4) Glicogenosis Type V 5) AMP-desaminase deficiency 3. Endocrine myopathies 1) Hypothyroidism 2) Hyperparathyroidism (primary and secondary) 3) Osteomalacia of any aetiology 4. Hypokalemia (prolonged administration of diuretics), administration of statins, hemofibrozil, epsilon-aminocapron acid and other drugs. A number of diseases which should be differentiated from DM/PM are characterised by proximal muscle weakness and are not associated with myalgias. They are the following: 1. Demyelinating plyneuropathies 2. Intermittent porphyria 3. Myasthenia 4. Lamber-Iton’s syndrome 5. Spinal amyotrophy of Kugelberg-Welander 6. Progressive muscular dystrophies: a) Extremity-girdle Erb’s disease b) Facial-shoulder-scapular (myodystrophia Landuzi-Dejerine). 7. Hypercorticism, hyperthyroidism, acromegalia 8. Acid maltase deficiency 9. Chronic alcohol myopathy 10. Guillain-Barre’s syndrome 11. Drug-induced myopathies (caused by penicillamin, azothimidin, cimetidin, colchicines, glucocorticoids, cyclosporine, azathioprin, etc.) It is important not only to diagnose PM/DM, but also to determine its clinical form and to perform differential diagnostics of primary (idiopathic) and secondary (tumorous) DM/PM. PM/DM is often associated with rheumatic diseases. These diseases amount to 20% of all overlap syndromes. DM/PM is most commonly associated another connective- tissue disease or systemic scleroderma, rheumatoid arthritis or systemic lupus erythematosus. Less commonly DM/PM are associated with nodular periaatheriitis or rheumatism. It is usually diagnosed if clinical and laboratory findings of myositis and one or more connective-tissue diseases are present. Treatment. Large doses of glucocorticoids (GC) help control muscle involvement in most patients. The minimum effective dose of GC is about 1mg/kg for children and adults. The earlier the treatment is started, the more effective it will be. Large doses of GC should be administered for 2 – 4 months until clearly marked signs of improvement appear. These signs usually include reduction of muscle weakness and facial edema, improvement of phonation, swallowing, appearance of pigmentation in the area of erythema as well as improvement of laboratory findings and muscle enzyme activity. However, creatine phosphokinase activity doesn’t help decide on efficacy of treatment. Glucocorticoids in the dose of 1 mg/kg should be administered for 4 months before one decides on efficacy of treatment. A more prolonged period (not less than 6 months) is necessary for regeneration of muscle fibers. It should be considered when monitoring the patients and estimating efficacy of treatment. There are different treatment and dosage options; however, the treatment of each patient should be strictly individualized. The doctor should evaluate the patient’s condition, efficacy of treatment, tolerance of the selected drug, etc. The maintenance dose should be selected and it should be administered for some years; however, in stable clinical remission the maintenance dose can be reduced or even withdrawn. In increased clinical and laboratory disease activity, presence of visceral organ involvement and progressive myopathy pulse therapy with high doses of methylprednisolone (1000 mg) is typically administered. Methylprednisolone is usually administered intravenously with 0, 9% isotonic solution of sodium chloride (500 ml) or 5% glucose solution. The course of therapy lasts for 3 days. Cytostatic drugs are also used in the treatment of PM/DM. Most experts believe that cytostatics are not effective without adequate glucocorticoid therapy. When cytostatic drugs are administered in combination with glucocorticoids, they have a “steroid-saving” action. It means that they give the possibility to achieve clinical effect with low doses of glucocorticoids). In DM/PM metotrexat, azathioprin, chlorbutin and cyclophosphamid are used . Indications for administration of cytostatics are the following: 1. PM/DM resistant to maximum doses of glucocorticoids. 2. Presence of concomitant diseases or adverse effects, which limit the administration of glucocorticoids. 3. Unresponsiveness of some patients to glucocorticoid therapy. Methotrexate which has few side effects and is characterised by low carcinogenicity compared with other cytotoxic drugs is the most beneficial. Azathyoprin ranks the second, whereas alkylating agents such as Cyclophosphan, Chlorbutin should be indicated only if methotrexate and azathyoprin therapy was ineffective. Oral methotrexate should be given in the dose of 7.5 mg to 25 – 30 mg weekly. Treatment should be started with a small dose. The dose should be gradually increased by 0.25 mg weekly until the optimum one. In patients who can`t take methotrexate orally, it should be given should be intravenously. Intravenous methotrexate should be started with 0.2 mg/kg once a week, increasing the dose by 0.2 mg/kg every 7 days. Toxicity is evaluated after 6 days following the beginning of treatment and when the cumulative dose of 1500 mg is reached, liver biopsy is usually indicated. The dose of methotrexate should be reduced gradually, considering clinical and laboratory findings and creatine phosphokinase levels. Azathyoprin isadministered in the dose of 2 – 3 mg/kg. Medical dose is 100 – 150 mg daily. The maximum clinical effect is typically revealed only 6 – 9 months after the beginning of treatment. The maintainance dose is 50 mg daily. It should be decreased by 25 mg according to the same pattern as with methotrexate. According to Steinberg (1991), if methotrexate and azathyoprine are ineffective, combined treatment with 2 drugs should be undertaken. Cyclophosphamide is rarely effective, but it is typically selected in interstitial pulmonary fibrosis. In PM/DM it should be used in patients who are unresponsive to methotrexate and azathyoprine. Cases of effective treatment with Chlorbutin (4 mg daily) in patients who received high doses of glucocorticoids, methotrexate and pulse therapy with methylprednisolone without marked clinical effect have been reported. There is evidence for successful use of Cyclosporine A in patients with juvenile DM and in adults with DM, especially in interstitial pulmonary fibrosis.